Prime Premium Big Game Fly Line - FlyBass.com | Bronzeback Enterprises, L.L.C. Are you tired of paying $75 - $100 for fly line? Nearly all fly lines are made in Canada from the same manufacturers - as are these! You cannot buy a better line at such a great price! 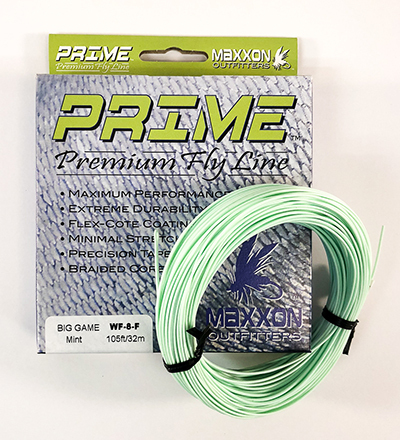 PRIME PREMIUM is designed using state of the art fly line production technology, packed with aggressive features and built for anglers looking to maximize performance at a fraction of the cost! BIG GAME has a signature heavy-headed profile, weight forward design which is suited for throwing bigger bugs, or when weather conditions are less than favorable. The front-loaded taper of this line’s profile assists in better transfer of loop energy, making it out-perform standard weight forward tapers, especially in windy conditions. BIG GAME also maximizes rod performance even at short casting distances or when quick shooting is a must, making it a great line choice with 7wt-10wt rods. Lines Available for 7wt - 10wt rods.